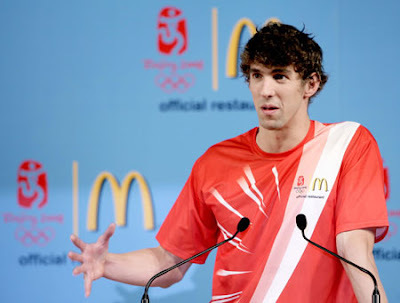 Phelps Signs Deal with McDonald's & Frosted Flakes? It's always nice when celebrities set "fine" examples for others (especially kids) to follow. In fact, now that Olympic Superstar Michael Phelps has signed a lucrative deal with McDonald's and Frosted Flakes, you can be sure that will be all I'm eating for breakfast, lunch and dinner. I'm serious! If Michael Phelps (arguably one of the greatest athletes of the decade) is on the Mickey Dee's diet than it can't be that bad for you! Oh wait, I apologize! He signed a deal with Corn Flakes too - so it's all good right? I mean how many kids are willingly eating Corn Flakes these days? Ha-ha, so true! Cornflakes are awful unless loaded with sugar. It's so sad that an amazing specimen like him is sending such an awful message to kids - but how else is he supposed to make money as an athlete...right? ?